Individuals interested in working on computers and having an in-demand job often choose to become computer technician. Learn more about this occupation, including what education is required and what to expect in job market. Computer technicians perform a wide variety of services throughout the course of their days and throughout their careers. They install, troubleshoot, maintain, repair and analyze computer systems and equipment. They work various types of systems from tablets and laptops to entire computer systems. They may even work in large facilities that operate robotics. They may install hardware, troubleshoot networking problems, install security systems, repair defective hardware or replace components. Some technician work as help desk and support technicians over the telephone. Their exact duties may vary depending on where they work, what type of training and experience they possess and what area of specialization they choose to work. They may also be in charge of installing upgrades on computer systems so that all computers work together in a business. Repair technician: Their duties include repairing defective computer and computer parts. They may work for a specific firm or work independently as freelance technicians. Network technician: Their duties include connecting a computer to a network for Internet access. They also ensure the network is security, install security patches and determine where networking parts should be installed within the building. Help desk and customer service technician: These professionals help troubleshoot computers and networks over the phone. Help desk technicians may work on both small and large problems. They either walk the client through the problem or advise them of the best option. Server technician: These professionals hook up computers so that they’re all part of one server network and generally find work with firms that have many computers. Computer forensic technician:Computer forensic technicians analyze and monitor computers and computer systems to determine if criminal activities have taken place or to prevent them in the future. Because of the various areas in which computer techs may choose to work, the career path may also vary. However, the most common path towards becoming a technician is obtaining training and earning certifications in that specific area. They are many certifications or credentials a technician may earn to advance his or her training and career goals. To obtain certification, the candidate must pass a certification exam and, in some cases, show proof that they had completed a formal training program. Microsoft also offers various certifications for computer technicians, although their certifications are most based on computer software than computer hardware. Computer techs are typically eligible to take certifications once they’ve completed training and obtained work experience. In most cases, the individual must have experience to advance to the next level of certification. The amount and type of education required to work as a certified technician depends on what type of work the individual wishes to perform as well as the level of training he or she wants to obtain. Regardless, a computer tech must have some sort of training. Some technician earn bachelor’s degrees while other begin their careers after earning associate degrees or completing certificate programs. An aspiring technician may also choose to just complete specific courses based on his or her area of interest. However, employers tend to prefer to hire computer techs with more training. Several training programs can be found at technical schools, community colleges and universities. Associate degree programs take about two years to complete, and bachelor’s degree programs are generally four years in duration. In a typical associate degree program, the student will complete both general education courses and computer-related courses. Most programs also require the student to complete an internship to obtain hands-on training working on computers and computer systems. Depending on the program, the student is usually prepared to take certain certification exams once they have completed the training. Some programs include certifications as part of the training. 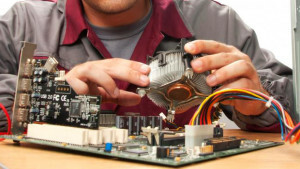 One major difference between an associate degree program and a bachelor degree program, besides the duration, is that associate degreegenerally focus on the main area of computer repair and service. The bachelor degree programs have more courses and allow the student to focus on a specific area of computers such as networks, hardware, software or security, among others. With the increased use of distance learning, many schools offer training online. These programs, generally offered as hybrid programs, allow the students to complete much of the coursework through distance learning but must make arrangements to complete an internship or externship at a business in their area. Although completing a training program is the first step towards working as a professional technician, obtaining work experience is equally as important to potential employers. Computer technicians are part of a growing field that is in demand and continues to grow. The U.S. Bureau of Labor Statistics (BLS) predicts that computer support specialists should see a job growth of 17 percent from 2012-2022. The growing technology and increased use of computer and cloud technology are the biggest factors that contribute to the good employment potential. The BLS also reports that computer service technicians working in computer system design firms could even see a job growth of up to 49 percent. Service technicians earned an annual average wage of $55,260, Network technicians earned the highest wage during the time. Computer repair technician wages nationwide ranged from $30,345 to $86,034. Factors that can affect wages include years of work experience, level of training, employer and geographic location. A graduate of a computer technician program may find work as a service technician or an IT specialist. With additional training and experience, the individual may find work as one of the following professionals. One biggest advantage to working as a computer tech is that the longer the individual works at this job, the more experience he or she will gain. With the addition of continuing education, work experience and earning additional certifications as they become available, the sky is the limit to the types of career opportunities available to computer service technicians. As with all professions and occupations, there are both advantages and disadvantages to becoming and working as a computer tech. Below are a list of pros and cons of working as a professional tech. An individual may begin the career with minimal training and learn on the job. Computer technology is a growing field. They are always in demand. Offers many areas of specialization. Flexibility in where they can work. Offers many chances of advancement. Opportunity to meet many different types of people. Must have some sort of training. Continuing education is required to keep up with the latest technology. Troubleshooting and finding a problem may get frustrating. Must have hands small enough to be able to work on the small parts found in laptops and tablets. As stated above, the best way towards a successful career as a computer technician is to obtain training and earn as many certifications as possible. As technology continues to grow, so does the need for qualified and highly-trained technicians. In addition, the technician must keep up with the latest technology so that he or she may have the knowledge and skill required to repair, install and troubleshoot computers as well as perform new updates as needed. Being knowledgeable of as many areas of computer technology as possible will also be beneficial to a technician’s career. If a information technology firm is interested in hiring a technician, they are more inclined to hire someone that can cover all areas of the computer as opposed to someone that only deals with software or hardware issues. As technology continues to change each year, or even each month, the computer tech must be aware of the change and prepared to make the necessary upgrades and updates. This can often be accomplished by taking continuing education courses. Continuing education is often required to maintain certifications. A computer technician is never completely finished with training as long as we continue to see newer computer and technology devices.